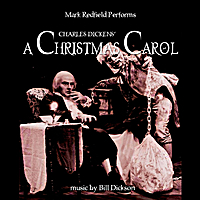 Mark Redfield brings Scrooge and your favorite Dickens' characters to life in this delightful performance of "A Christmas Carol". Since 1843, A Christmas Carol has delighted millions around the globe and has come to embody the spirit of Christmas for all who have been touched by its magic. Your favorite characters come vividly to life in this rich performance by Mark Redfield. With wonderful music by Bill Dickson, gather ’round this holiday season to hear the beauty and timeless art that is Charles Dickens’ A Christmas Carol. "Redfield's meticulous diction, perceptive phrasing, excellent transitions and impeccable timing make his Scrooge the finest we have heard. His is a classic interpretation that is almost Shakespearean."